Tomas Rangel helps his son, Evan, 7, put on his football jersey at a park on Sunday, Oct. 22, 2017, in Weslaco. MISSION — Amid a chorus of people chanting his name, Evan Rangel was lifted into the air on the shoulders of the Mission Mustangs youth football team. Wearing a mouthpiece for the first time in his life, he was smiling ear to ear after his 30-yard run to the end zone. The Texas Youth Football Association has seen plenty of touchdowns from local youngsters, but not many have inspired tears from the fans like 7-year-old Rangel’s run Oct. 14 at Mission Veterans High School. 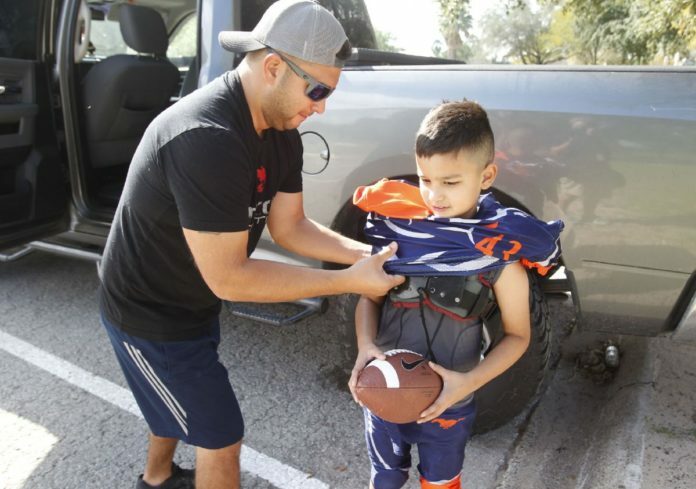 An avid football fan and a testicular cancer survivor for almost six years, the Weslaco native was given the opportunity to score a ceremonial touchdown for the Mustangs, a youth team in his age group, in honor of winning his fight six years ago. Due to his surgery in 2011, his family has kept him out of football to avoid putting him in harm’s way. Evan takes a football to school every day at Airport Elementary School in Weslaco, but for a time his parents were worried he wouldn’t make it to grade school. Before Evan’s second birthday, his parents found a growth. A local pediatric surgeon performed emergency surgery, and a biopsy of the removed testicle revealed it to be stage 2 testicular cancer — an extremely rare occurrence for children that age. Evan’s father knew little about cancer but was struck by fear. He said every cancer patient he knew of to that point had died. Tomas remembers having to ask the doctor a difficult question. The solution was aggressive chemotherapy at Texas Children’s Hospital in Houston. Evan endured seven chemotherapy treatments in just four months, and his left shoulder still bears the scar from the portacath used to administer them. Doctors told his family he likely wouldn’t experience side effects like brittle fingernails, hair loss and blister fevers, but he endured them all. Through the treatment, Evan was always full of energy. His parents recall the days when he was at Texas Children’s running around with an IV still attached. They had to run behind him to make sure the medicine continued to flow. Confined to a wing of a hospital that can be a drain for children, but Evan kept his family’s spirits up. His mother, Adriana Rangel, was pregnant with the couple’s second son, Ethan, during Evan’s treatment cycle. Tomas and Adriana agree that while the ordeal was extremely taxing, Evan at least went through the treatment when he was young. “He doesn’t remember any of it,” Tomas Rangel said.